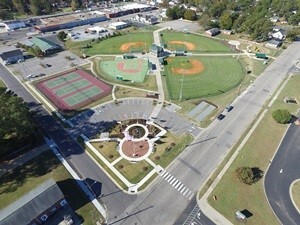 The Dunn Parks & Recreation office is located in the Dunn Community Center at 205 Jackson Road on the back side of Tart Park. We are open during lunch hours. We are currently accepting basketball registrations. The deadline is November 14th. We are excited to announce our new online registration. Our new website link at https://dunnparks.recdesk.com/Community/Home is powered through RecDesk. This new and interactive website provides real time updates about our Recreational activities. You can use you mobile device or computer to create a profile and register for programs. This will also allow the use of debit and credit card payments online and at our office. We require a birth certificate at the time of registration if we do not have one on file already for any sport registration. New participants must register in our office.